I just spent a week at the beach and one of the best parts of the trip was sitting under a beach umbrella reading a great book. It’s the simple pleasures, you know. 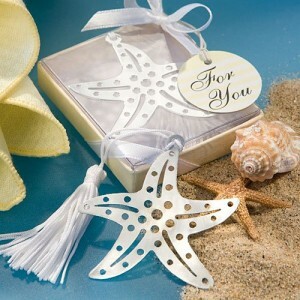 Which brings me to today’s fun wedding favor for your beach destination wedding – the starfish bookmark. If you’re planning a destination wedding that just happens to be near a beach it’s a good bet some of your guests might be bringing the latest summer best seller with them. And what better way to thank them for coming to your wedding than with a lovely bookmark in the shape of a starfish? It’s such a fun favor and every time your friend or family member reads a book (yes, people do still read “real” books! ), they’ll remember your lovely day at the beach. You can find the starfish bookmark and other beach themed wedding favors here.